During the past few decades the motoring manufacturers have made significant design contributions to the safety of all road users. Apart from seat belts, ABS and airbags, car manufacturers have also developed active driving assistance systems, such as traction control and computer-controlled stability programmes. More recently there has been a focus on tyre pressure monitoring systems (TPMS) and the development of tyres with run flat capability. A run flat tyre is a pneumatic vehicle tyre that is designed to resist the effects of deflation when punctured, avoiding hazardous tyre changes and allowing the driver to continue the journey at a reduced speed. Run flat tyres have been described as the "first important revolution in tyre design since the invention of the pneumatic tyre." Run flat tyres were first patented in 1892, re-developed in 1978 and offered as an option in the 1990s mainly for two-seat sports cars with little room for spare tyres and jacks. These tyres have since become popular with manufacturers of high-end luxury cars, because of their safety and convenience, costing double the price of sports tyres. Run flat tyres work like conventional tyres. 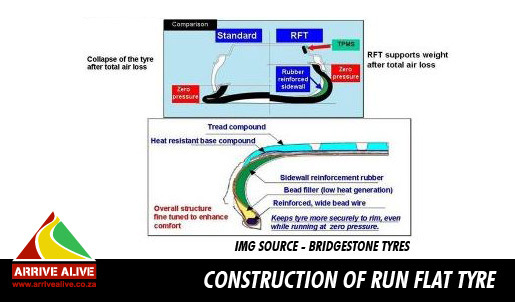 They still contain air; to reduce the load that the run-flat system has to bear, to spread the weight of the vehicle evenly on the road surface, and to maximise the contact patch between the car and the road. 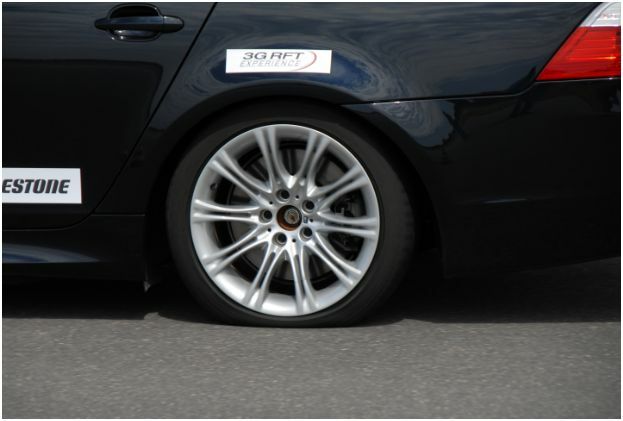 Once run flat tyres detect the first signs of deflation (usually caused by punctures), it automatically applies a number of counter-effects to ensure safety and continuous driving. A run flat tyre offers a very high standard of driving comfort; the driver will barely notice any loss of pressure in the tyre. For this reason these tyres are used on vehicles equipped with a tyre pressure monitoring system, which will display the drop in tyre pressure on the dashboard instrument panel. The tyre is built with stiffer side-walls (sometimes 50% thicker) that can bear the weight of the vehicle even when the pressure within the tyre is greatly reduced. The side-walls are typically constructed of layers of rubber and a heat-resistant cord that prevent the side-walls from folding or creasing. The bead around the edge of the tyre is also specialized to grip the wheel rim such as to avoid becoming detached from the rim. The tyre’s side walls are usually made of an extra layer supported by a heat-resistant cord to keep the tyre in the original position even under the weight or road bumps. These tyres contain an extra lining within the tyre that self-seals in the event of a small hole due to a nail or screw. In this way, the loss of air is prevented from the outset so that that the tyre is either permanently self-repairing or at least loses air very slowly. This type is usually less efficient as it still allows the air to get out of the tyre – until the seal comes into effect. Additionally, it could fail to stop the deflation completely, but still it could allow the driver to reach the first service centre. In this system, there is an additional support ring attached to the wheel that can support the weight of the vehicle in the event of a loss of pressure. While these systems generally offer better ride quality because their sidewall's stiffness can be equivalent to a standard tyre, the requirement to have both special wheels and special tyres increases cost and limit these systems from widespread use. Run flat tyre technology has been developed as a solution to overcome the danger of a tyre deflating while you’re driving or changing a tyre next to the road. Run flat tyre technology does away with concerns about flat tyres and the added dangers of fast moving traffic, poor visibility, bad weather or criminal activity on the roads. 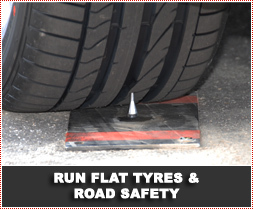 The run flat tyre enables safe driving from the point when a puncture occurs until the driver can drive the vehicle to a safe location. Safety and reduced risk of accident - blowouts and tyre deflation can be serious driving risks for drivers. 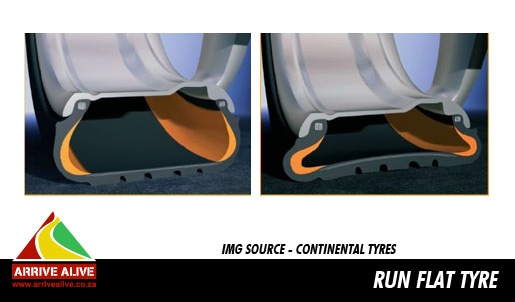 Safer handling - the run flat tyre protects the car and maintains handling on the road. Safety from criminal element on the roads - no need to stop in areas of risk/dangerous crime areas. Convenience - it is not necessary to stop immediately to change a tyre and the journey can be continued. Insurance benefit - using run flat tyres can decrease insurance premiums, as insurance companies want to provide an incentive for customers to increase safety. Increased luggage space - the absence of the spare tyre means more luggage space so the driver could use the additional room for other purposes. Increased space could contribute to improved integration of alternative power in future generations of automobiles. Tyre pressure monitoring devices warn the driver of a tyre pressure loss. We have detailed the many benefits of run flat tyres, but this raises the question - why do we not find many more vehicles with run flat tyres. Why do we only find a small percentage of vehicles with these tyres? The cost is an important aspect of a run flat tyre. Run flat tyres can be substantially more expensive than conventional tyres, and there is some dispute about the tread wear over the life of the tyres. Installing such a tyre is obviously more expensive than fitting the car with regular ones, thus raising the overall price of the car - manufacturers argue however that the various safety advantages of run flat tyres is more than enough reason to counter this argument. Run flat tyres require the presence of tyre pressure monitoring sensors. The system is there to inform the driver of a tyre that is losing pressure. These sensors can either be a "Valve and Sensor Unit" or a Sensor strapped to the inside of the rim and can be rather expensive if not standard equipment on your vehicle. Repairing/replacing a run flat tyre that got damaged after using it is considered too costly in many cases. Some run flat tyres have a 20 % higher rolling resistance, in part due to their added structural material and mass; this can worsen a vehicle's fuel efficiency. A heavier tyre could translate into reduced engine performance, increased fuel consumption – or lower fuel efficiency – and, in some cases, reduced braking performance. 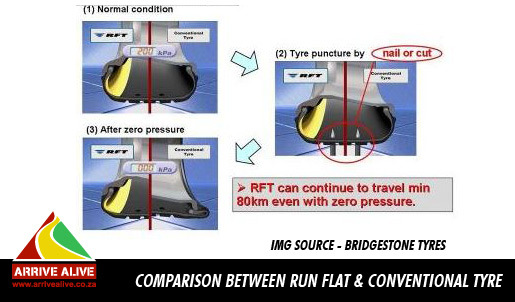 The latter is obviously the most important, but thanks to some new developments in the run flat technology, this appears to be getting solved. The overall weight increase of the tyres may be slightly offset in a vehicle by the elimination of a spare tyre and tyre jack, although the fact that the run flats are "unsprung" weight makes this an uneven trade. The excess tyre weight is around the perimeter of the tyre, which increases inertia/momentum of tyre rotation, slowing acceleration and increasing stopping distances. These tyres may be stiffer, making for a stiffer ride which can be an issue for some drivers. Many cars designed for use with run flat tyres lack an area for a spare tyre, which means that if a driver opts to switch to conventional tyres, there might be no room for a backup in the event of a flat tyre. Many of these concerns are being addressed by vehicle and tyre manufacturers. It is however important that the road user and vehicle owner are alerted to these points of criticism. This will allow the vehicle owner to raise any points of concern with the vehicle dealer and gain much needed peace of mind! Whether you are the vehicle owner or the driver of a vehicle with run flat tyres, it would be worthwhile to consider a few safety aspects before going on the road. When properly used, run flat tyres meet the highest standards in terms of safety and handling characteristics. It is best to always check with the guidance provided by your vehicle manufacturer/tyre supplier on how to use these tyres. Before you start your journey make sure whether you have run flat tyres or conventional tyres - confirm that it is a run flat tyre by checking the sidewall for the mark of identification. Run flat tyres should only be fitted on vehicles equipped with a tyre pressure monitoring system and preferably where the tyre was fitted as original equipment by the vehicle manufacturer. Vehicle manufacturers recommend the fitment of approved wheel and tyre combinations, as non-approved wheels or tyres may make contact with the vehicle body due to impermissible tolerances, even though they are the same size. It is not recommended changing the fitted run flat tyres to conventional tyres, because of constructional difference it may influence handling and performance. In the case of an emergency it is possible to fit a standard tyre to the car – if the vehicle has a spare tyre. This can only be a temporary solution for a limited time. The standard tyre must also comply with recommended speed and load recommendation from the vehicle manufacturer. Vehicles fitted with run flat tyres in most cases do not have a spare tyre. If you wish to change to conventional tyres, it is recommended that you consult with your local vehicle dealer to obtain written confirmation. The Dealer must also include which tread pattern and sizes to fit if a conventional tyre is allowed. Run flat tyres can be repaired as with other tyres. If the hole is in the belt or crown area, a mushroom plug repair can be done for temporary emergency measures, but the tyre should be replaced at the earliest possible convenience. Repairs cannot be carried out in the shoulder or sidewall areas like with conventional tyres. Manufacturers however recommend run flat tyres are replaced and not repaired, as it is difficult to know exactly what damage has been caused to the tyre once deflated. Special care is needed when mounting or de-mounting a tyre to a rim where a pressure sensor is used - rather use professionals to change these tyres. Safe tyres are very important safety components on each and every vehicle. Not only are they important for steering and proper vehicle control, but also for speedy and effective response in the event of emergency and accident avoidance. On South African roads we have the added danger of both questionable road conditions off the main roads – and criminals preying on drivers and passengers in distress. If it is possible to avoid stopping next to the road to change tyres - this could only benefit the safety of drivers and passengers. We can expect that run flat tyres will increase in popularity and be an important addition to many of the newer vehicles on our roads!